How did you hear about CAES? Why did you decide that CAES would be a good service for you? Melissa: Through PDD (Government of Alberta, Persons with Developmental Disabilities)- I mentioned that I was having troubles finding a job to my coordinator. I was interested in another agency, but they had a long waitlist, to be honest. I feel with CAES, you guys are more one on one and another agency wouldn’t be able to give me the amount of personal support and that has made a huge difference. The support that I get from CAES makes me comfortable talking with you and I feel like you guys know me and I can reach out to you about anything. What were some of the struggles you were having with employment before working with CAES? Melissa: I felt like there were problems with my resume. To me, the way that it was, didn’t look professional and it was affecting my ability to get interviews. I felt good and bad about looking for jobs; every time I would apply and then not get a call back or not get a job, I would feel rejected and that was hard. It made me feel down about myself altogether. What have you enjoyed most about accessing CAES services? Melissa: You guys are friendly – I am more comfortable with you guys. You took the time to get to know me and asked me some difficult questions about me that really lead to finding the right job for me! How has CAES helped you be successful? What have you enjoyed most about your work with CAES? 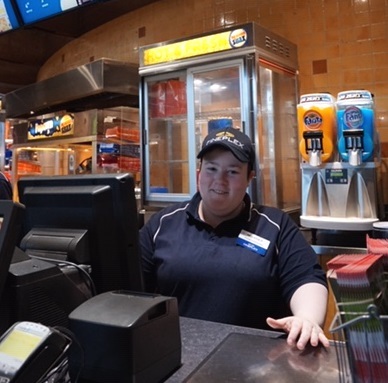 Melissa: With CAES support, Melissa attended a Cineplex training program called ‘Get Into It’ and ended up securing a part time concession position at the Sunridge Cineplex location. Getting a job is obviously the biggest thing! I feel great, honestly! I go into my job and I WANT to be there. I don’t dread having to work, I love my coworkers and it’s been great altogether. I enjoy being around friendly people the most. Before working, I felt really isolated and now I go into work and have a great time around good people. I have had a bit of a hard couple of years and having a job has given me purpose and has made me more motivated in general.